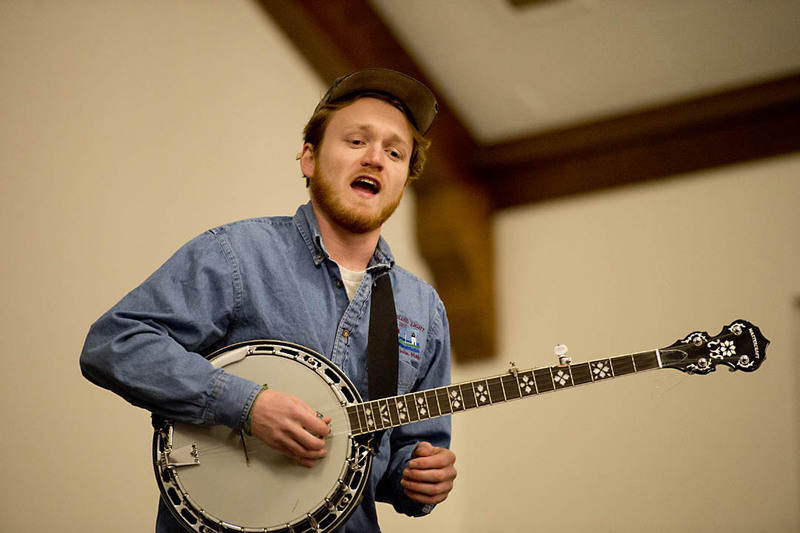 Grady Hogan ’13 performed in Memorial Commons with Lena and Los Morose Bros. Photograph by Michael Brady/Bates College. As the Crawl got under way at 4:30 p.m. Jan. 25, a good place to ease into it was the Bobcat Den, renovated this year into a brighter space with open sightlines, beer on tap and seating at booth and hightop tables. 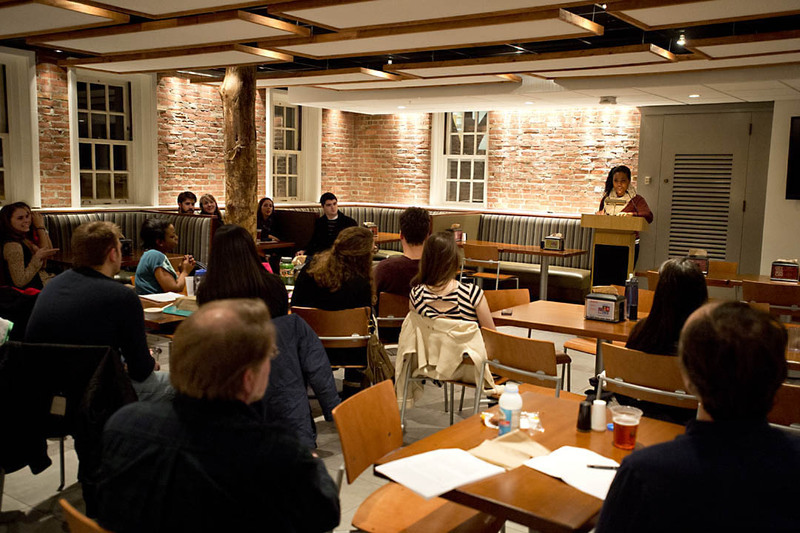 Here the Arts Crawl program was literary readings — funny, confessional, intense, exploring — presented by 10 student poets and prose writers and hosted by Rob Farnsworth, a member of the English faculty and himself an esteemed poet. 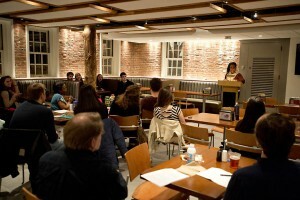 Alanna Prince ’13 reads from her poetry in the Bobcat Den during the 2013 Arts Crawl. Photograph by Michael Bradley/Bates College. and dancers, led by Zoe Fahy ’13, who undertook such exercises as using one part of the anatomy to trace the shape of another — for instance, using a foot to describe the whorls of the ear. For one viewer, the unadorned nature of the Memorial Commons stage — lacking lights, sets or sound system — was key to the interactive nature of the experience. “It was a little out of everyone’s comfort zone — performers were not used to being so close and vulnerable in front of the audience, and the audience not used to examining the performers so close,” said Mariya Manahova ’14. 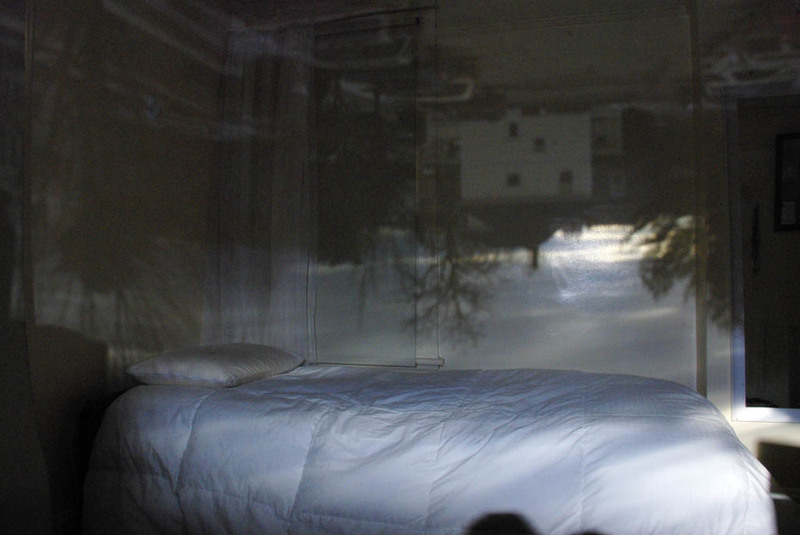 An untitled camera obscura image by Eleanor Anaclerio ’13. Chase Hall was one of the two poles of the Arts Crawl axis, the other being Olin Arts Center, a campus away. In between came the New Commons fireplace lounge, with an assortment of quiet music, and Coram Library’s Imaging Center, home of the Giant Photo Booth. The Olin Concert Hall featured diverse music, including a set by the Bates Jazz Combo, whose singers, Fiona Robins ’15 and Laura Franke ’15, brought a stylish and authentic feel to mid-20th century standards. Senior art majors, meanwhile, opened their studios. Eleanor Anaclerio borrows the dorm rooms of friends to make intriguing “camera obscura” photographs. She blacks out the windows except for the aperture that admits the ghostly outdoors image to be captured with a digital camera. 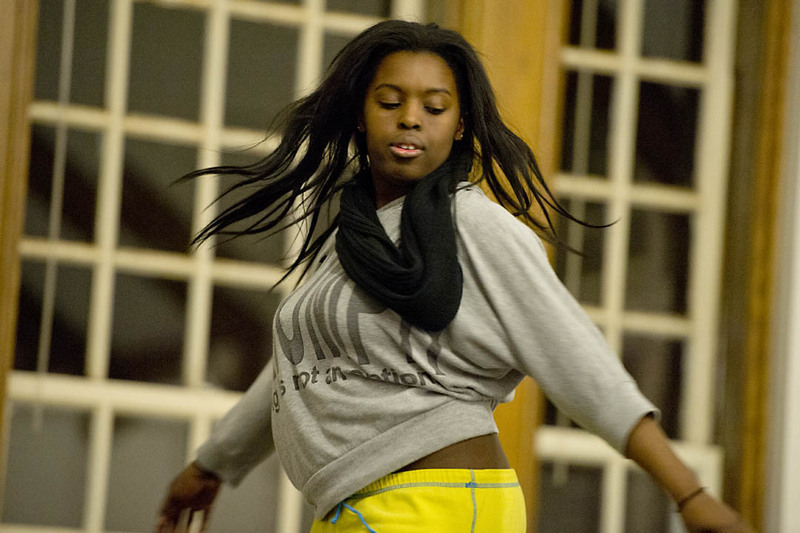 Dancer Tomisha Edwards ’15 performs in Memorial Commons during Bates’ 2013 Arts Crawl. Photograph by Michael Bradley/Bates College. The open studio is part of the learning process, said her studio mate, Isaac Thompson ’13, who makes geometrical sculptures from steel and see-through plastic. “You’re figuring out this stuff for yourself while talking about it, too,” he said. so I do not want to hear if you are a dentist.